The highly anticipated trials for the IAAF World Championships begin Friday in Birmingham and look like hosting a series of exciting clashes, as well as boasting big names like Greg Rutherford, Jessica Ennis-Hill and Katarina Johnson-Thompson. The first two eligible athletes in each trial event will be selected providing they are either the reigning European champion or have achieved the qualification standard on at least two occasions this year. Further athletes may be selected and even the IAAF selection standard may not be necessary. For the first time this year the world governing body will extend invitations to those outside the standards based on rankings, where field sizes allow. This will be done on or around August 10. Athletes will have until July 26 to attain the standards and the team will be picked straight after that. The action will be covered live on BBC only on the Sunday after highlights from the opening two days. Reports, results and pictures will appear on athleticsweekly.com and in next week’s issue of Athletics Weekly. Sprint hurdles sisters Tiffany Porter and Cindy Ofili lead the line-up in a stacked field. 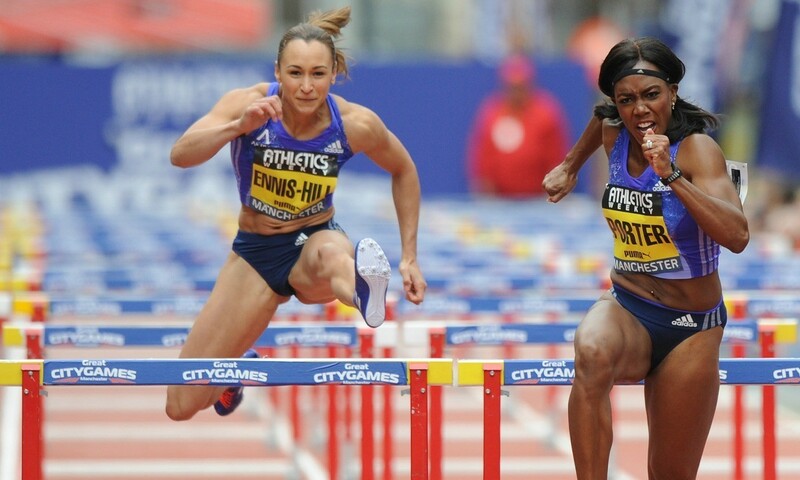 Porter, 27, and Ofili, 20, are top of the UK rankings for 100m hurdles so far this summer – the younger of the siblings has only recently been declared to run for Great Britain – both runners were born and raised in Michigan, United States, but their mother, Lilian, was born in London. They face European indoor medallists Lucy Hatton and Serita Solomon – two in-form athletes who have run 12.84 and 12.87 this summer. Jessica Ennis-Hill is also in the line-up – the returning Olympic heptathlon champion took 100m hurdles bronze back in 2005 and has won the sprint hurdles title three times. Then there is fellow heptathlete Katarina Johnson-Thompson, who will be attacking her PB of 13.41. All eyes will be on Dina Asher-Smith to see if she can break the championship records and, ironically, return them into the hands of British athletes. The long-standing championship record of 11.15 for 100m was set by American Evelyn Ashford in 1991 and the 200m best of 22.71 by Australia’s Cathy Freeman in 1993 – a period when overseas guests were allowed in the AAA Championships, the forerunner to today’s British Championships. This season Asher-Smith has smashed Montell Douglas’s British 100m record with 11.02 in Hengelo and she then went No.2 on the UK all-time 200m rankings with a superb 22.30 at the Diamond League in Birmingham. Asha Philip will not want to relinquish her 100m crown, though, as the Loughborough-based sprinter is going for a hat-trick of titles after winning the British title in 2013 and 2014. The women’s long jump is one of the events of the weekend and in good conditions the seven-metre barrier could come under threat. UK record-holder Shara Proctor faces Katarina Johnson-Thompson and Lorraine Ugen – all of whom have jumped in the 6.90s this year. Add Abigail Irozuru and Jazmin Sawyers into the mix and the crowd in the Alexander Stadium – and TV viewers watching on the BBC’s only day of coverage – are in for a treat. The men’s 400m could be an intriguing battle. European and defending champion Martyn Rooney is yet to find his best form this year. Matthew Hudson-Smith is arguably favourite, while Conrad Williams is fastest this year. The improving Jarryd Dunn and Rabah Yousif could also be in the mix. Olympic winner Greg Rutherford is due to line up in the long jump, although he has only competed at the national championships twice since 2006. Looking in great shape lately, he faces Dan Bramble, the find of the year in the event, as well as former UK record-holder Chris Tomlinson.